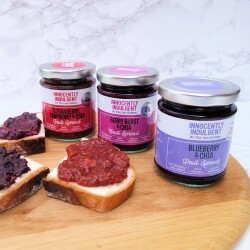 Premium hand-made jams, totally delicious and free from refined sugar. Corina Maeting founded the Jam Goddess as she was suffering from adrenal fatigue and wanted to have a treat that she could enjoy without feeling guilty. So she started making jams that are free from refined sugar - her family has been making jams since 1896 so jam-making is in her blood! She developed her own jam recipes containing fruits, stevia and chia seeds, and no refined sugar. 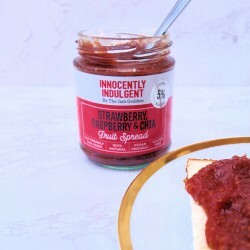 Traditional jams contain 60% sugar, so she is a real innovator in this field and wanted the jams to be nutritious as well as tasty, with a low sugar status.